The Dark Side of the Force? Oh no. This is the bling side. 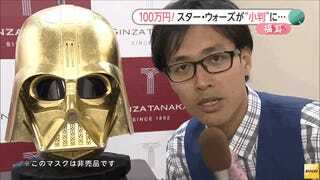 Tokyo’s Ginza Tanaka has covered a Darth Vader helmet in gold. According to The Wall Street Journal, the jeweler won’t divulge how much it cost to create this glittery Vader and isn’t offering the mask for sale. Instead, as Reuters adds, the gold-plated Darth Vader helmet will be given to Disney, because Disney doesn’t have enough money. You can purchase a golden commemorative coins, with the smaller five-gram Darth Vader ones priced at 65,000 yen each (US$545). There’s also 11-coin set priced at one million yen ($8,355). In an interview with FNN, a spokesperson for Ginza Tanaka was asked how much it would cost to cover C3-PO in real gold, and she said that if you estimated that the droid weighed 60 kilograms (132 pounds), it would cost about 6 million yen or about $50,000.